What is it that really satisfies us after feasting on a good meal or devouring elegant party food? In An Everlasting Meal, chef and food writer Tamar Adler writes that scientists have found that it’s not just the starches and proteins doing their work of nourishing us. “We feel sated when our senses have been animated,” she writes. 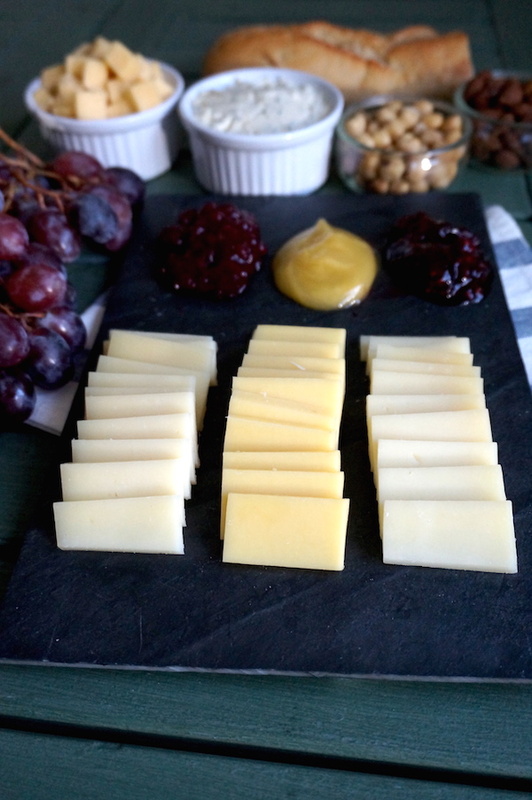 A well designed cheese board offers you the chance to animate your guests’ senses. The textures and colors beckon from a distance, and soon, everyone is gathered around the cheese board, noshing and chatting. So how do you design a really good one? 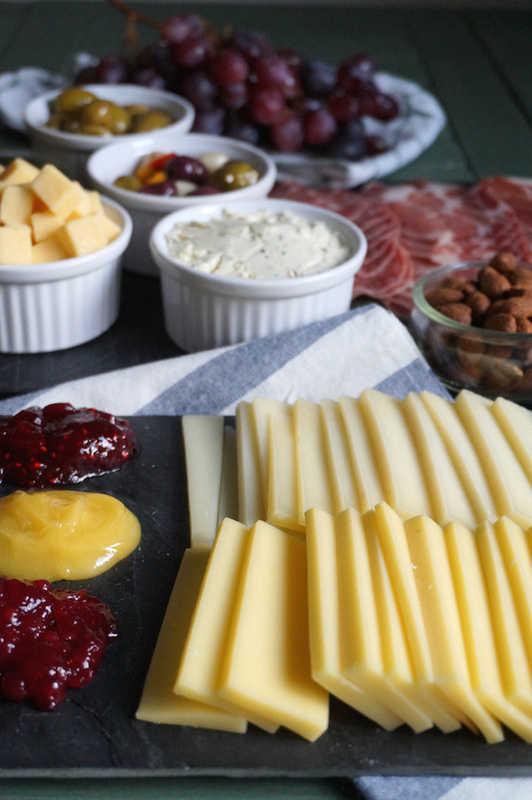 Remembering the vivid cheese boards with which a friend of mine always enriched holiday parties, baby showers, and even last-minute weekend get-togethers, I got in touch with this cheese board maven, Erin Clark, to ask her advice on how to craft elegant cheese boards. “I don’t think you can ever have a cheese board that is too full!” says Erin. As you fill it, create visual interest by layering items. Erin recommends “mounds and textures and colors.” Add berries or leaves to make the display fancier. “Colors are easy to add with fruit.” Or, set a wedge of cheese on “a bright leaf.” You can set the mood for Christmas with “some tiny twigs and evergreen cuttings in a mini glass.” Erin has saved her two young kids’ baby food jars for this purpose. “Breadsticks are nice for that layering component as they add height,” says Erin. If you want to branch out from breadsticks or crackers, Erin recommends thinly slicing and toasting your favorite special bread. “Walnut-raisin would be especially good with cheddar and honey,” she suggests. “Dried fruit pairs really well with cheese because it is not as intensely sweet as fresh fruit, so it doesn’t overwhelm a mild cheese like Colby.” Erin recommends reserving fruit like fresh grapes as a partner for a salty cheese like Parmesan, and pairing crackers, nuts and dried figs, blueberries or other fruits with mild cheese varieties. Erin recommends keeping fruits and veggies apart rather than throwing them all together on a cheese board. To incorporate fresh veggies on a tray of their own, Erin recommends using Colby to create a fondue to dip your favorite veggies. 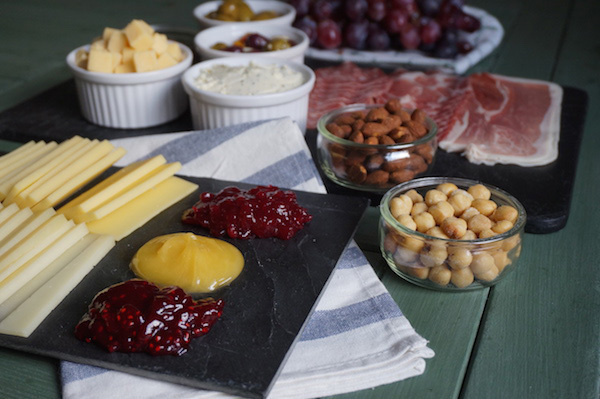 Now that your cheese board is lookin’ good, you’ll just want to make sure it doesn’t look too beautiful to eat! Invite guests to dig in.